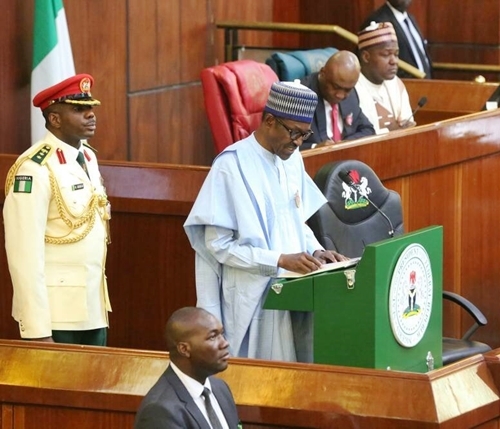 P While speaking at the joint session of the National Assembly during the 2019 Budget presentation on Wednesday, President Muhammadu Buhari, cautioned lawmakers to comport themselves as they are on television and being watched across the world. The president reacted after he was being heckled by some lawmakers believed to be members of the opposition. While some lawmakers stood up to give the President a clap, some others heckled him shouting, ‘Lies, propaganda’. A lawmaker was heard calling Buhari, ‘grass cutter’ in reference to the scandal which the last Secretary to the Government of the Federation, Babachir Lawal, was enmeshed. When the President was stating the achievements of his administration in the area of fighting corruption, some lawmakers shouted him down, saying, “propaganda, which corruption are you fighting?”, “Grass cutter.” The budget presentation which was being shown live on national television show some lawmakers shout “Propaganda!”, “Fraud!”, while some others shouted “Its a lie!”, as the president read a speech before them. The President who at some point got visibly angry, told the lawmakers: “Distinguished members, let us conduct ourselves properly. The world is watching us; we are supposed to be above this.” The budget presentation was ongoing as at the time of filing this report.